If you’re tired of looking out at your sad, outdated swimming pool, consider a NJ tri-state area pool renovation that can add new life to your backyard. By renovating your existing pool, you can turn your yard into a breathtaking oasis for fun and relaxation. And just because the weather is cold right now, doesn’t mean you can’t start planning for next summer’s pool parties! Why Do a Pool Renovation? There are a variety of reasons people decide to renovate their pools. Sometimes it’s because a swimming pool has become outdated and needs repair. Other times it’s because the need for the pool has changed. A family with an older pool might want to add some fun features to make it more exciting for their kids, like a water slide or rock to jump off. Or, if all the kids are gone, people might want the pool to be a more relaxing place, and may consider adding a water feature like a waterfall, to add tranquility to the backyard. Whatever your reason, considering a pool renovation in NJ, NJ, or CT can be a cost-effective way to give yourself a new pool by starting with what you already have. Pool Renovation Process No two pool remodels are the same. That’s why the team at Thomas Flint Design will meet with you to evaluate your current pool, discuss your needs and dreams, and help you come up with a plan that suits your budget and gives you a pool renovation that brings new life to your yard. After coming up with a plan for your pool, we secure building permits and schedule the project with you. The process itself could involve everything from removing and replacing the old liner or plaster and re-plumbing the pool with state-of-the-art amenities like a robotic pool cleaner. We can replace the surrounding patio with custom stonework and frame it with fresh landscaping, or add a new water feature to the pool itself. 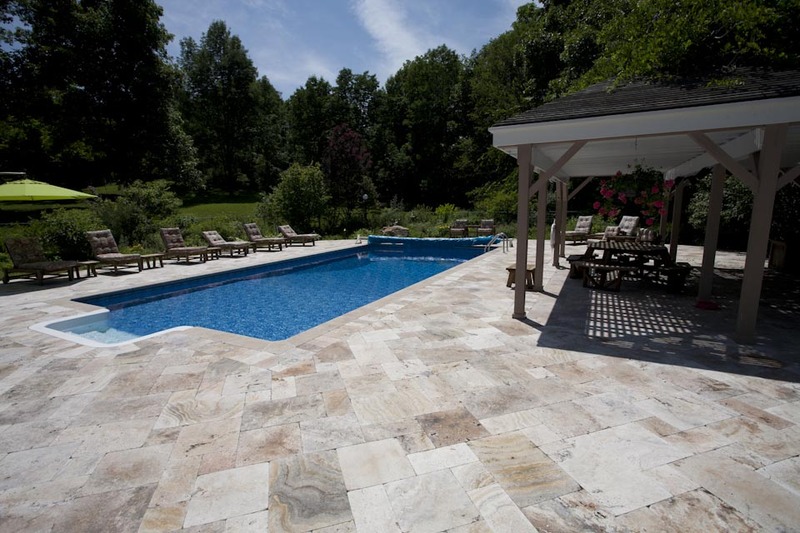 A custom NJ tri-state area pool renovation from Thomas Flint Design can take as little as two weeks to complete, and costs a fraction of a brand new pool. Contact the team at Thomas Flint today to to discuss your pool renovation project. We’ve been serving the New Jersey tri-state area since 2003 and will work with you to make your dream a reality. Check out our portfolio to see more of the NJ tri-state area swimming pools we have created for customers. Thomas Flint Landscape Design & Development is a Ramsey, New Jersey swimming pool contractor that specializes in pool design, swimming pool renovations, pool liner replacement, and new pool construction for people in the New Jersey tri-state area, including New York and Connecticut.